Emmet Cahill, photographed on Sunday, 7 August 2016. March 22, 2018 7:30 p.m.
March 22, 2018 9:30 p.m.
Sony Music recording artist and Celtic Thunder lead singer Emmet Cahill returns to Springfield on Thursday, March 22 at 7:30 p.m. to perform songs from his debut orchestral album, “Emmet Cahill’s Ireland”. His album reached #1 on the Amazon, iTunes and Billboard World Music charts and offers the very best of the traditional Irish repertoire. Song selections include: “Danny Boy”, “Tura Lura Lura – An Irish Lullaby”, “My Cavan Girl”, “When Irish Eyes are Smiling” and more. 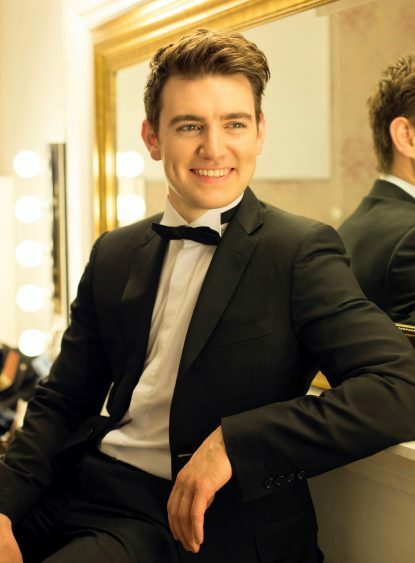 General admission tickets are $30 and may be purchased online at http://www.emmetcahill.com/tour-dates/. A limited number of Meet & Greet tickets, which include a pre-show meeting with Cahill plus the concert, are available for $45. St. Kevin’s Catholic Church is located at 200 W. Sproul Road in Springfield.